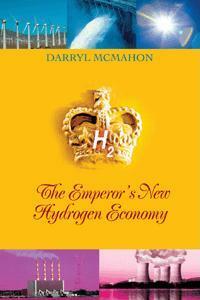 Your Information Is Invited | Why are there so few electric cars? 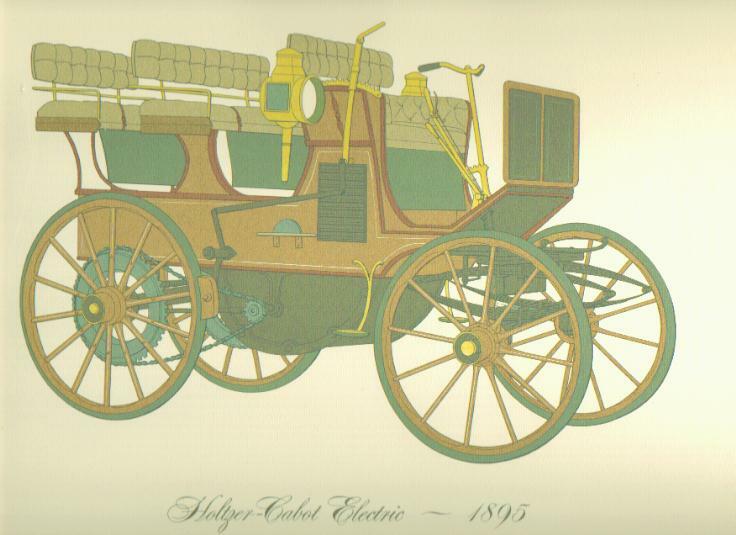 The Kolner Accumulatorenwerke Gottfried Hagen of Cologne-Kalk (Germany) produced electric cars from 1903 to 1908. They built both commercial and private cars, many of which saw service as taxi-cabs. These cars, which were also sold as Urbanus and K.E.W. brands, saw wide-spread use, particularly in Germany. While Hagen stopped building the cars in 1908, the firm still operates making batteries and watering systems. The Harbilt Electric Vehicle Co. of Manchester (England) built electric delivery vans. Several of these were assembled in San Francisco CA by Electric Vehicle Inc. in the 1970's and at least 30 saw use by the United States Postal Service in Cupertino CA beginning in 1976. The USPS Harbilts were retired from service in 1982. E.W. Hart & Co. of Luton (England) produced a light electric 2-seater in 1900 and 1901 called the Lutonia. The Lutonia used a 2-hp Bergmann electric motor, which was directly connected to the rear axle (single speed). This firm also marketed other electric and hybrid vehicles built by Lohner-Porsche and Austro-Daimler. The Hanoversche Waggonfabrik AG of Hanover (Germany) produced small electric cars and electric vans from 1923 to 1935. The car was a 2-seater, notable for the use of tandem seating. Better known as a manufacturer of batteries which were supplied to other car-makers, the Headlands Patent Electric Storage Battery Co. Ltd. of London (England) did produce a few electric vehicles between 1897 and 1900 under the Headland name. A 2-seater phaeton and a dogcart were among the models produced. Healy & Co. of New York NY produced a small number of electric cars from 1912 to 1916. It appears these were custom-built vehicles and relatively expensive. Healy was a noted coach-builder of the period. La Compagnie de voitures electriques Helvetia of Combs-la-Ville (France) produced these cars from 1899 to 1900. The vehicles were designed by Jacques Fischer-Hinnen, who left Helvetia to join Frantisek Krizik to build electric cars in Prague in 1900. A number of electric victorias and cabs were produced. The name probably arises from the fact that Fischer-Hinnen was Swiss and there were plans to build the cars in Switzerland at some point, but this never happened. 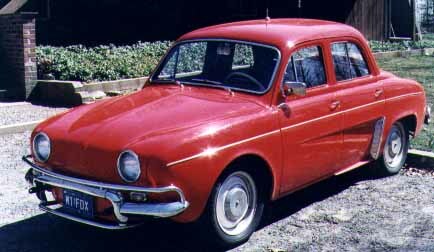 The Henney Kilowatt was a 1959 to 1961 Renault Dauphine converted to electric power. It was powered by an electric motor rated at 7.1 hp, and used a 36-volt traction battery system based on lead-acid golf-cart batteries. It boasted an advertised top speed of 35 mph (drivers have reported reaching 40 mph) and a range of 40 miles per charge. Operators have reported an operating range up to 50 miles per charge. 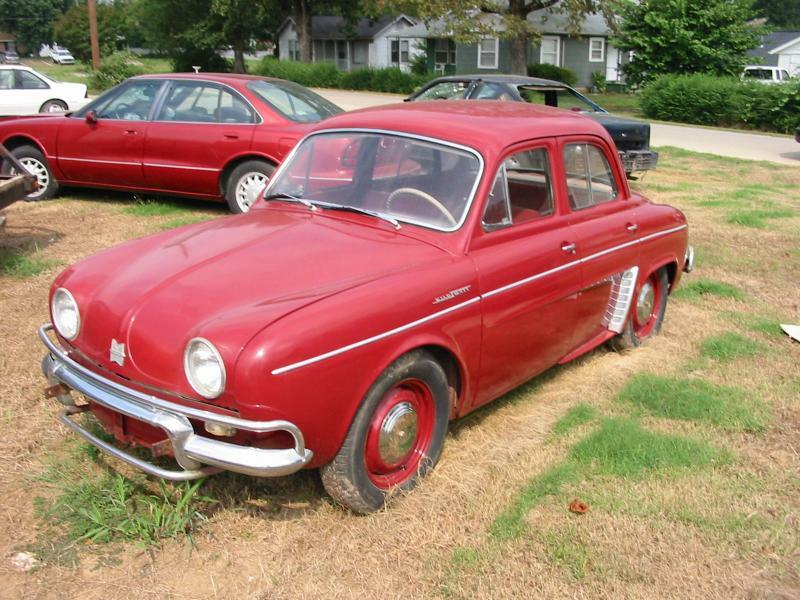 It was priced at US$3,600 in 1961. Approximately 120 were built, and the great majority were sold to electrical utilities. This was the target market (for electric meter readers) established for the vehicle by the Eureka-Williams company (of Eureka vacuum cleaner fame) that produced the vehicle at Conastoga, NY by the subsidiary Henney Motor Company Division. As of October 1997, the author is aware that several are still in operation, and at least two are being restored. One of these vehicles served as the inspiration for Feel Good Cars of Toronto in 2000. The Berliner Maschinenfabrik Henschel & Co. of Berlin (Germany) produced both electric and gasoline-powered cars, but mostly electrics, from 1899 to 1906. The firm is credited with producing Berlin's first electric taxicab in 1899. The James McNoughton Co. of Buffalo, NY produced the Hercules in 1907. Both 2-seater and 4-seater models were produced. The vehicles used a chain drive to transmit power to the rear axle. The Hewitt-Lindstrom Electric Co. of Chicago IL was known primarily for producing heavy electric trucks and buses, but did produce some electric cars, notably a 2-seater runabout. From the time of its first inception, the early electric car never departed very far from its coach-building tradition. The Holtzer-Cabot is a prime example, a vehicle whose principal accents were comfort, smoothness of operation, and simplicity of control. This wagon, built on commission from a wealthy resident of Boston, clearly follows the design of the English break coach. It weighed 5100 pounds and was powerred by 44 chloride cell batteries capable of producing speeds of five, eight, and fifteen miles per hour. These were operated by the lever shown alongside the steering shaft. A notched arc and spring latch locked the mechanism in the various speed positions. The makers built the carriage as water-tight as possible and covered it with liberal amounts of acid-proof paint; if a cell were to break and spill acid no damage to motor or its connections directly underneath the batteries. Shiny cut glass lamps of 10 candle power each, distinctively elegant step plates and leather upholstery tooled by experienced craftsmen, gave the Holtzer-Cabot as smart an appearance as any horse-drawn "turn-out" of the 1890's. The Hub Motor Co. of Chicago, IL marketed electric cars from 1899 to 1900 under the Hub Electric marque. These vehicles were unique in that they were powered by 4 motors which mounted in the wheel hubs. The vehicles were actually produced by Westinghouse of Pittsburg PA. Maximum speed was reported to be 15 mph. Produced first by the R.C.H. 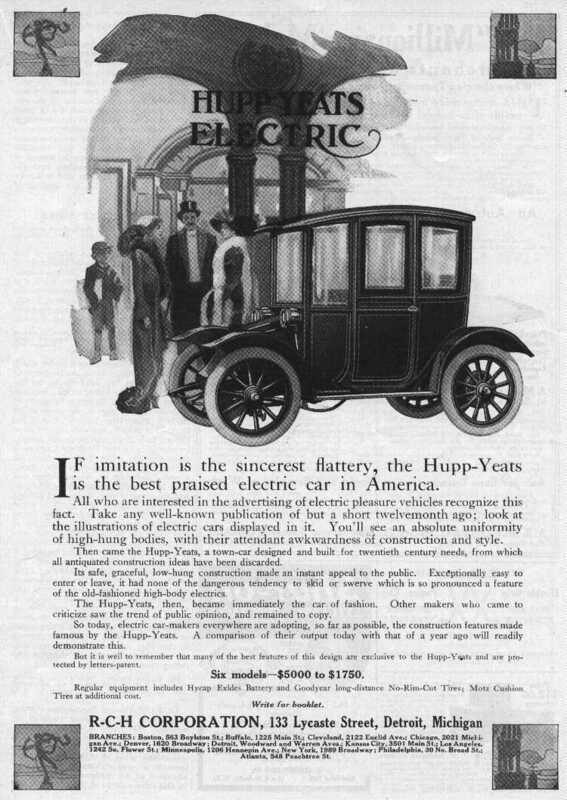 Corp (1911-1912) and then by the Hupp-Yeats Electric Car Co. (1912-1919), both of Detroit, MI, the Hupp-Yeats was a 4-seater electric car. It was produced in both open and closed body styles. The cars used Westinghouse motors. There is a 1912 Hupp-Yeats Electric Coach in the collection of the Reynolds-Alberta Museum in Wetaskiwin AB. The Hummingbird was produced by Electric Passenger Cars (in the mid-1970's?). It claimed a range of 45 to 95 km per charge and a maximum speed of 80 km/h.